Border Police launch operation to dismantle a number of buildings in the Zeit Ra'anan area in Talmonim district of western Samaria. 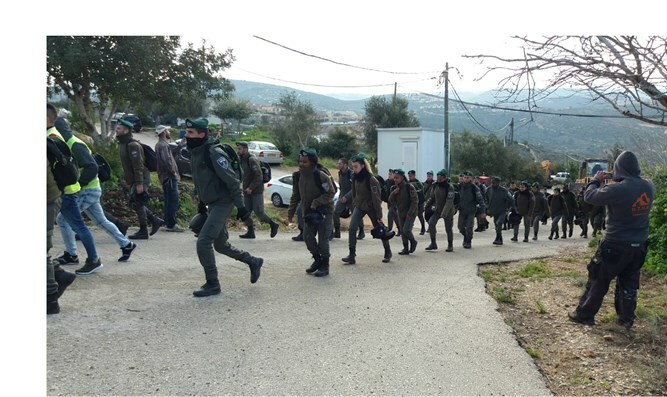 Dozens of Border Police officers joined Civil Administration officials in the town of Zeit Ra’anan Monday morning, ahead of planned evacuation for part of the community. Seven structures are slated for demolition Monday in the town Zeit Ra’anan in the Talmonim bloc in southwestern Samaria. Residents say they requested an extension of several days in order to prepare for the evictions, in exchange for promises of an orderly evacuation. But it appears Monday that Civil Administration officials are going through with the demolition as originally planned. It should be noted that one of the buildings expected to be destroyed by the Border Police is the workshop of Matanya Aharonovitch, brother of Zvi Aharonovitch from the Nativ Ha’avot neighborhood in Gush Etzion. His carpentry shop was destroyed a year ago when police evacuated most of the neighborhood. Locals say they received notice Monday morning that no occupied residential buildings will be demolished in today's evacuation. While residents of Zeit Raanan protested the demolition, some residents of the neighboring town of Neriya say today's evacuation was not part of an effort by the Israeli left to curtail the settlement enterprise, but an attempt by the local settlement council to rein in a handful of squatters who took over land belonging to Neriya. "Presenting this as if it were an evacuation and demolition of settlers is a total distortion," one Neriya resident told Arutz Sheva. "These families [in Zeit Raanan] are hooligans - they're the ones who built these illegal structures in Zeit Raanan. 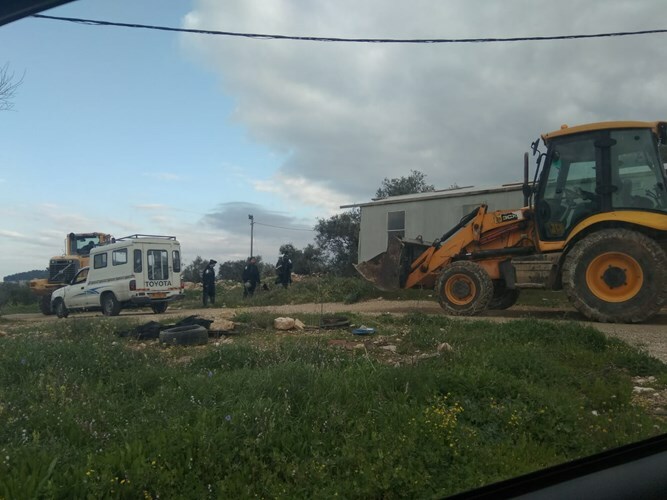 These bullies have used threats and violent attacks against other residents of Zeit Raanan, grabbing land for themselves and trying to prevent the expansion of Neriya and the construction of a new neighborhood in Zeit Raanan. The buildings which were demolished today weren't build for the sake of pioneering, but for entirely personal interests while trampling the rights of others." Another Neriya resident detailed the threats and violence employed by some of the residents of Zeit Raanan. "They take over land which belongs to Neriya, which is supposed to be used for a new neighborhood. They stole other people's land, and then attacked people who 'trespassed' on it. Sometimes they will sick their dogs on people who challenge them, as a way of intimidating them."